One of the most important attributes of the Romans was the ability to assimilate ideas and customs from the cultures and societies which they encountered. Roman music and their musical instrument was therefore highly influenced by the Greeks. Roman music was used at a variety of different occasions: during processions, at weddings and funerals, at public spectacles such as the games at the Colosseum, religious ceremonies and public performances. The content of this article provides interesting history, facts and information about life in Ancient Rome including Roman Music. The buccina was a kind of horn-trumpet, anciently made out of a shell. In later times it was carved from horn, and perhaps from wood or metal, so as to imitate the shell. The buccina was curved for the convenience of the performer, with a very wide mouth, to diffuse and increase the sound. The buccina was chiefly used to proclaim the watches of the day and of the night. It was also blown at funerals, and at festive entertainments both before and after sitting down for meals. The musician who played the buccina was called buccinator. Roman Music: The cornu was a wind instrument, anciently made of horn, but afterwards of brasss. A large musical instrument it was curved nearly in the shape of a C, with a cross-piece to steady the instrument for the convenience of the performer. The series of notes was produced without keys or holes, by the modification of the breath and the lips at the mouthpiece. The classicum, which originally meant a signal rather than the musical instrument which gave the signal, was usually sounded with the cornu. Roman Music: The cymbalum was a musical instrument, in the shape of two half globes, which were held one in each hand by the performer, and played by being struck against each other. Several kinds of cymbals are found on ancient monuments and was used in the worship of Cybele, Bacchus, Juno and other gods and goddesses. The hydraulus was a water-organ. A row of huge pipes capable of emitting the most powerful as well as the softest sounds, by adapting keys with leversand with perforated sliders to open and shut the mouths of the pipes, a supply of wind being obtained, without intermission, by bellows, in which the pressure of water performed the same part which is fulfilled in the modern organ by a weight. Its pipes were made of bronze and reed. The number of stops, and consequently of its rows of pipes, varied from one to eight. 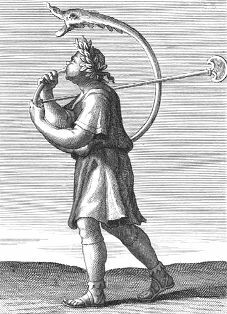 Roman Music: The lituus the sacerdotal trumpet (used in religious rites especially related to the military) was employed by Romulus when he proclaimed the title of his city. It was the musical instrument which was peculiar to cavalry, whilst the tuba belonged to infantry. Its tones are usually characterised as harsh and shrill. The sambuca was a large harp which was considerably higher than the stature of the performer, and was placed upon the ground. The trigonum was a small triangular harp which it resembled the sambuca in the principles of its construction, but was smaller and hand held. Roman Music: The lyra or lyre, aka Testudo, was one of the most ancient musical instruments of the stringed kind. The lyra is also called in Latin testudo, because it was made of a tortoise-shell. The number of strings of the lyre from three to seven. The lyre was distinctive by the two horns which rose as from the head of a stag. The lyre when played stood in an upright position between the knees, whilst the cithara stood upon the knees of the player. Both instruments were held with the left hand, and played with the right. The lyre was only played as an accompaniment to songs. The lyre, or cithara was at first used in the recitations of epic poetry as a prelude before the minstrel commenced his story, and in the intervals or pauses between the several parts. The lyre has given its name to a species of poetry called lyric poetry. The Sistrum was a bronze rattle which was introduced to Rome from from Egypt. The rattle consisting of a narrow plate curved like a sword-belt through which passed a few rods, and made a loud shrill sound. These musical instruments were sometimes made of silver or even of gold. The shakes were three together which would make a sort of rude music. Roman Music: The tibia is described as a pipe or flute and was the commonest musical instrument of the Romans. It was very frequently a hollow cane perforated with holes. In other instances it was made of some kind of wood. Among the Romans it was much more usual to play on two pipes at the same time.Their length was about 15 inches and each of them had a separate mouth-piece, a hole at the end and five holes along the top and one underneath. The tibia was used at sacrifices, entertainments and funerals. The Tintinnabulum was a bell. The many different types and forms of bells were in proportion to their applications. Some bell-shaped whilst others were more like a Chinese gong. Bells were attached to the collars of chariot-horses, at sacrifices and during Bacchanalian processions. Roman Music: The tuba was a bronze trumpet, distinguished from the cornu by being straight while the cornu was curved. The long, straight, bronze tubes of the tuba gradually increased in diameter and terminated in a bell-shaped aperture. The tuba was employed in war for signals of every description, at the games, at funerals and at public festivals. The tones of the tuba were described as of a harsh and fear-inspiring character. Roman Music: The Tympana was a small drum carried in the hand. Of these, some resembled a modern tambourine with bells. The Tympana were covered with the hides of oxen and were beaten with a stick like a drum or with the hand like a tambourine. Typana and were greatly employed in all wild enthusiastic religious rites. The content of this Roman Music category on life in Ancient Rome provides free educational details, facts and information for reference and research for schools, colleges and homework about the music of Ancient Rome. Refer to the Colosseum Sitemap for a comprehensive search on interesting different categories containing the history, facts and information about the music of Ancient Rome.